Walking to the start line with "David Emch" (Winner of Thailand North Face 100k 2 weeks ago), we see Kenyan runners jogging and warming up. David says "Well thats podium out the window". Thinking this funny I agree, little did I know what the future would hold and how the stars would aline for both of us. Running in the dark is scary but exciting. We started at 5am and the sun is yet to rise, above the sky a blanket of stars. I threw my freebie torch away when we set off as the streets we were running on had lamps. Now its pitch black, luckily a runner in front is switching their torch on now and then, I stay close behind vaguely able to make out the white lines on the road. I’ve decided to run for 2 hours before taking my first gel. I have five gels, calculating one gel every 30 mins will take me up till 4 hrs 30 mins. Normally I burn 80 calories per mile but as we are running uphill my body is asking 100 calories per mile. I realise that five gels totaling 500 calories is not going to cut it, if I'm to burn over 3000 calories on this race... gulp! I'm running well and have reached mile 14 feeling pretty good. Mostly running sub 8 minute miles. Also it’s light now as the sun has risen. All is fine and dandy but something has happened, time has stopped, I'm not aware of this happening but it has. I don't know it right now but I have run clean out of energy. As in a mist my brain is disconnected from my body, unable to think with any clarity. Then suddenly like a boxer given smelling salts the realisation hits me, I know I'm running on body fat and my tank is empty. This is a problem and the thought of problem solving excites me. Reaching into my pocket I pull out one of my last remaining gels and eat it. Running uphill is not easy it requires a certain approach, you need patience as pace is slower. The incline has really set in now. I'm in the national park heading up towards Doi Inthanon, Thailands tallest mountain. This is a road Ultra and this road will take me to the summit but I've got some running to do before I get there. A thought occurs, I realise to make this experience easier than it’s feeling now I must change my mind set. The whole time I've been thinking I'm racing against other runners but now realise I'm not running against people, I'm actually running with people. I feel a weight has been lifted from my shoulders and running uphill feels so much easier. David passed me earlier but I still see him ahead along with another runner who is wearing no shirt. I get closer to the shirtless man and pass him, he's walking and says "The next section is really steep so I'm hiking". I feel strong and run on. 20 minutes later he passes me back. I keep seeing him ahead but every now and then a corner blocks my view. Finally David and the shirtless man do not appear as I get around the corners. I'm alone and have been for a while, the sun is out but it's still only 12 Degrees Celsius due to going up in altitude. I had noticed earlier how David and the other runner would hike up the steeper sections. I kept running on these sections but finally the mountain has broken me and I hike up a killer climb. I feel desperate, I had'nt figured I would hike during this ultra but as the first half of the course is pretty much flat the second half has all the accent which is over 2000 meters, in other words I'm getting my but kicked by this mountain. Running, hiking, running hiking and so it goes on until I'm no longer human just an empty vessel some how moving upwards and forwards. I have no gels left just water, I stop for 15 to 20 seconds at each check point to splash water on my face and pour a cup over the back of my neck to stop from over heating. The check points no longer have water melon which I was so much enjoying earlier, just plan water, it will have to do. My feet are hurting, this is my first road ultra (I'm a trail runner) and the lack of uneven terrain with the repetitive motion of my foot striking the ground has created a pain right on the ball of each of my feet. I tell myself its just a distraction and carry on. I get passed by a relay runner who looks fresh and full of energy which makes me feel worse. I start to feel small glimmers of hope as I tell myself I can do this, I know I can, its not going to get any worse. I'm still aware I must drink to avoid dehydration. I'm right on the edge of being able to just make it but at the same time so so close to just dropping onto my hands and knees and crawling to lay under a tree to be done with this suffering. Ahead I see a Kenyan runner, but he's not running, looks like a man wounded trying to get away from his attacker. He keeps looking behind and when he sees me he starts to run. Like a shark sensing blood the sight of his distress ignites something inside of me, which in turn pumps adrenaline threw my veins. Surging I chase him down. Drawing up beside him, I've never passed a Kenyan before so its new to me but this is ultra and in ultra sub 2 hr 20 minute marathons hold no value. Ultra is about dying and being reborn. As I pass the Kenyan our eyes lock with one another, for a moment I feel his soul, its burning, as is mine, the recognition is reflected by a knowingness between us. He say as I pass "Number two age catagory", I respond "No not me, thats not me". I run on ahead unbelieving, seeing a 48 kilometre sign I know I'm close but not that close, looking behind I see the Kenyan is not trying to catch me, I am now fuelled with a renewed enthusiasm. A minute or two ago I reached the highest point and now the road has flattened out, I see a sign "Only 1 kilometre to go". I take one last look behind me for fear of being chased down by the Kenyan he's not in view. I run on and before I know it I can see the finish line, one final push and this all comes to end. I grab the banner and hold it above my head, I'm elated. I hold the banner high for everyone to see. I did it, this is my moment of glory. I'm so happy I cuddle a hill tribe man who is standing close by looking at me, he matches my embrace with an equally warm embrace back. Then I cuddle the woman who places a medal over my head, the commentator laughs and cheers. I see David and the shirtless runner, we all congratulate each other, these guys finished 5 and 7 minutes ahead of me, during the race they felt a lifetime away. At the start of this David had aimed to get top 10 and he did just that with 10th so he achieved his projected goal. The Kenyan runners comes in, I approach him laughing saying how I didn't believe I was second, smiling at each other the pain is gone but so is the connection. Shared hardship brings people together. I now know its true I finished 2nd in my age category's and 11th overall. I have won 15,000 Baht and I came back from the dead by problem solving. 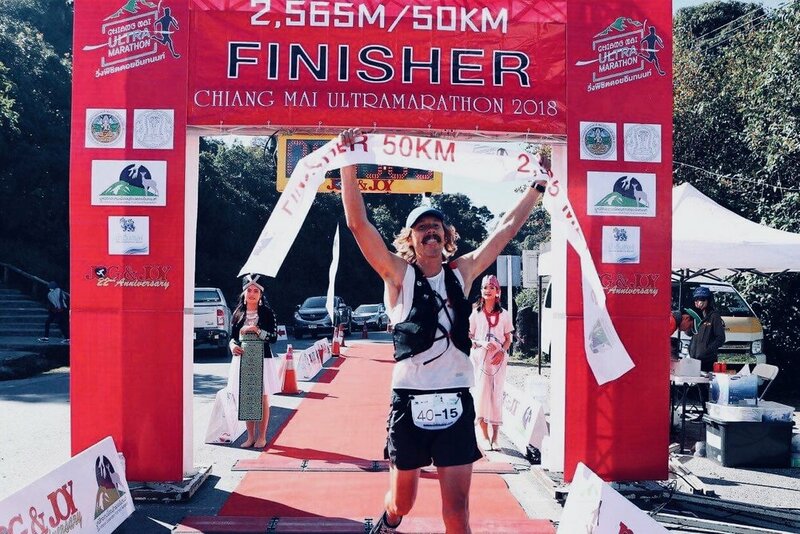 I feel I have accomplished so much today, I have learned so much in such a concentrated amount of time, thats what I love about ultra running.